I have a thing for overalls. In the mid ’90s I was a teenager and the trend for overalls came back in style. I wore mine everywhere paired with a striped shirt and heavy boots. Oh and a plaid flannel shirt. I called it the lumberjack look. Eventually, it went out of fashion and I have been longing for overalls return. Perhaps this is why I am drawn to the 1940s when vintage overalls moved from work-wear to fashion wear. The dark blue denim, wide legs, sweetheart neckline, giant pockets (MUST have pockets) and the clink of the metal clips makes me smile from ear to ear. Join me as I take a look back into fashions past and follow the progression of women’s vintage overalls through the 1910s, 1920s, 1930s, 1940s, 1950s and beyond. Want to skip the history? Scroll to the end to see where you can buy vintage overalls online. Ever since men began to wear overalls for labor work like farming, mining, railroading and machinery jobs women quickly followed. Overalls are much more comfortable to work in, stay held up, and provide more areas for large pockets. Overalls were not readily designed for women. They were a unisex item although most stores sold them in the only men’s section. Women had to make do with men’s overalls and with the stigma that ladies shouldn’t work laborious job. This all changed with the first world war. Women were called to replace men at home, on the farm, in factories, and other local occupations. The more laborious the job the more women had to turn to men’s work clothes for their needs. See photo on the right of 1916 Dutch women working as painters. During the late Edwardian era there were some women’s work clothing made just for these times. They was an early version of the coverall that looked like a dress but with the skirt sewn into wide pant legs that pegged at the ankle. These were sometimes called because of their remembrance to girl’s bloomers. Notice in the 1918 catalog on the left the different styles of overalls. There was the one piece coverall and a sleeveless jumpsuit with two straps that crossed in the back. After the war most women returned to their home life if they could. Other women had no choice but to keep working the family farm. They also had no choice but to continue to wear men’s overalls. 1920s vintage overalls were made of dark blue denim with wide cut legs that folded up over boots, a square bib front and two straps that either crossed in the back like an X or were met over the shoulders with triangular bib on the back. The later style kept the straps from falling off shoulders, a common problem for women with sloped shoulders. The idea of women wearing overalls for fashion instead of “men’s jobs” didn’t emerge until the late 1930s. The first group of women to wear them were not women yet but little girls. Boys had been wearing denim overalls, just like dad’s, for a few decades already. Smart mothers put their girls in durable overalls for playtime outside. Eventually the clothing market caught on and made overalls designed for little girls. Not to be confused with boys blue denim overalls, girls overalls were made of dark blue cotton with pockets on the front instead of the sides. These little girls turned into older girls and teenagers who still liked to wear overalls, especially in the summer when the light cotton was breathable enough to withstand hot days. Contrasting white stripes, buttons, stars and anchors were added resembling navy men’s uniforms. By the 1937, overalls were being advertised to women as acceptable (and comfortable) casual clothing worn at home, on vacation or enjoying leisurely outdoor sports and activities. Overalls were worn by Hollywood stars in their personal life at home on their California ranches, traveling to beachy destinations and possibly in movies (I couldn’t find a reference. Do you know?) This certainly helped propel the overalls fashion forward, even naming them “Hollywood Overalls” by some makers. These new fashionable overalls came in an assortment of primary colors in cotton twill or denim: red, green, yellow, and brown plus light, medium and dark blue. Pants were still wide leg but no longer folded at the cuff. Buttons replaced some mental buckles either at the top of the bib or down low on the waistband turning them into suspender pants. The yellow overalls in the right picture are “Tyrolean slacks” with detectable suspender bib. The fit of “play time” overalls changed to a more feminine silhouette with a nipped in waist, bust darts, scoop or V neck and a smaller bib. These were not worn for heavy labor jobs. 1940 Better Homes and Garden Cover with woman in overalls, gardening. The ruched tummy panel is unusual. 1940 and World War 2 brought back the overall into the work clothing genre but this time they were designed for women. Similar to play overalls they were made of heavy denim but with the more fitted designs on the 1930s. Working women’s Rosie’s overalls brought back the metal buckles, bib pockets and side pockets or extra large front pockets. When not working or after the war women returned to their playtime overalls. In summer teens and brave women wore their overalls without a shirt underneath. The bibs on these overalls took on the Pinafore shape with modest coverage around the bust to the back, only exposing the neck and shoulders. New materials were also introduced such as rayon or other synthetic and cotton blends. Lighter tans and greys, solids and stripes were part of these revived fashions although the classic navy blue with white buttons never went out of style. The late 1940s saw a big change in women’s fashion. People were tired of the depressing 1940s with memories of war and restriction as well menswear inspired utilitarian clothing. Women said goodbye to the 1930s-1940s overall and hello to the tailored jumpsuit. 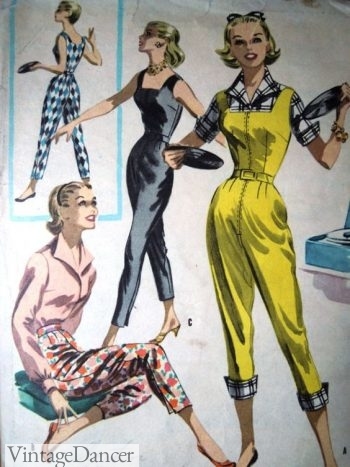 The pinafore bib overall paired with the slimmer fitting capri or cigarette pant resulted in the ’50s jumpsuit. It wasn’t very popular. Women preferred to wear top and bottom separates making it easier to have a bigger wardrobe on a smaller budget. The overall as we came to know it was gone. Not for work, not for leisure. It would come back again in the 1970s with bell bottoms and again in 1990s. It has come in and out of fashion in the last 10 years in various forms. My pair of ’40s style overalls came from Kim Kardashian in 2015! The current look favors a tight fit and low bib or a slightly looser throwback to the ’90s style. There is also a plethoa of 70s disco jumpsuits for 2019. Lucky for us who love mid-century vintage fashion we can still find 1930s and 1940s style overalls being remade by a handful of repro brands. Take a look at the 1940s women’s pants shopping page.